Top 3 Cities to Enjoy Cannabis Culture: So... Where's the Weed?! The west is alive with the smell of cannabis. From its countercultural beginning to a thriving black market and now a newly legal industry, cannabis culture is renewing at an exponential rate. Colorado, Oregon and Washington state have consistently led the charge for comprehensive marijuana legalization and reform. 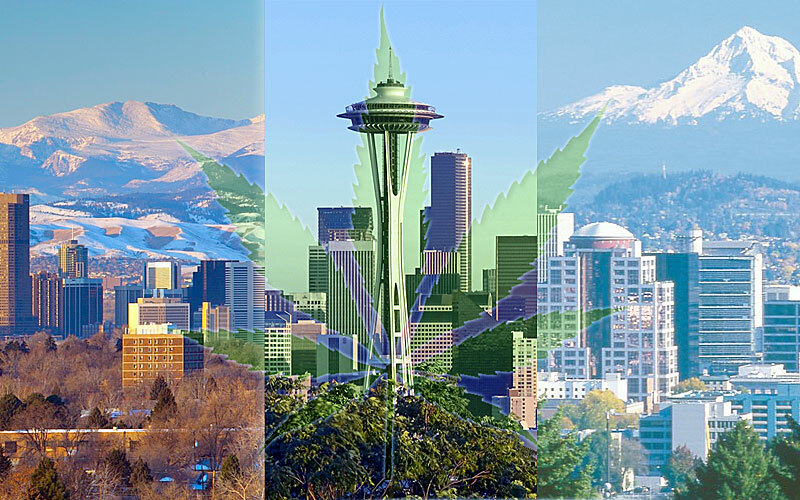 Now, as more states across America are passing legislation for medical and recreational legalization, Denver, CO; Portland, OR and Seattle, WA are thriving as a result of a reducing stigma toward cannabis and increased demand for products. This shift has greatly encouraged mass interest in finding exciting marijuana jobs. Folks from around the country are settling into these bustling metropolises to stake their claim on the cannabusiness. So, what exactly makes each of these cities the cream of the cannabis crop? It was only a matter of time before The Mile High City became the queen of cannabis. Colorado was the first state to pass adult, recreational marijuana use into law and has shocked other regions to take legislative action in its wake. Denver boasts a gorgeous natural landscape and a bustling sports and entertainment culture that is perfectly suited to intertwine with cannabis. Colorado Pot Guide reports that the state has issued over 900 business licenses to operate legal marijuana dispensaries. This is a staggering number considering that most shops are located in metropolitan areas. The good news: it is virtually impossible to walk around Denver without coming across a dispensary. The bad: for the indecisive, such a great variety of shops may complicate your choice of where to buy. If you’re a job seeker who wants to break into the booming legal pot scene, you will have no problem finding marijuana dispensary jobs in Denver. Lightshade, one of Denver’s premiere cannabis dispensaries, offers a unique experience for the medical and recreational customer. In additional to selling quality products, they also offer a viewing window to their small grow operation to give people a peek into the process of producing marijuana flower. Denver is also one of the few cities that has legal marijuana delivery services. This is especially important for medical marijuana patients, who may not be able to access a dispensary on their own, or hire a personal caregiver. Recently, Denver made the cannabis history books again by passing initiative 300, which allows for the “social” consumption of cannabis in venues like art galleries, record shops, cafes and more. While this initiative does not extend to Denver’s bars and nightclubs, it is a major advancement in normalizing cannabis use. There are a number of provisions that complicate the process of registering a business for this initiative, but it’s a great step in the right direction. Entire volumes can be written on Denver’s cannabis culture. In addition to dispensaries and other marijuana distribution services, the city offers venues and art spaces that cater to marijuana aficionados with themed galleries and performances. Portland is experiencing some of the most dramatic growth of any American city thanks to ultra-popular TV show, Portlandia, as well as an active cannabis scene. This weird (though, gentrified) city is supported by a diverse music and arts scene that openly includes cannabis in its coverage of news and entertainment. Two of Portland’s popular publications, The Portland Mercury and The Willamette Week consistently include analyses on cannabis as a plant, business and opportunity, engendering a more open discussion about the implications of marijuana legalization. Like Denver, Portland is absolutely brimming with marijuana dispensaries and individuals looking to find Portland marijuana dispensary jobs. All you have to do is make your way to NE Sandy Boulevard’s Green Mile and a jungle of neon plus signs will be ever-present in your periphery. Popular, artsy shops like TreeHouse Collective sustain consistent fan bases based on reasonable prices, fun atmosphere and an established presence. On the same street lies Nectar, a dispensary with multiple locations in and around Portland. There has been some fear of the corporate takeover of companies like Nectar, as some think they drive prices and quality down in favor of speed and a quick buck. Regardless of where you choose to visit, each dispensary will offer something new and probably quirky to your cannabis buying experience. Time and time again, one of the most beneficial assets Portland has to cannabis culture are its many beautiful parks and trails. Forest Park, which is the largest park in any city in America, makes you feel as though you’ve been instantaneously transported from the hustle and grind to the quiet and peaceful. Though I’m not advocating using cannabis products in public areas, (as this is illegal) Forest Park is an excellent place to go for a leisurely walk, intensive hike or mountain bike ride. For many, the accessibility of cannabis, alongside the ability to easily go into nature is a major asset that keeps them from leaving the City of Roses. Seattle is no stranger to leading a countercultural revolution. The birthplace of grunge has facilitated a cannabis culture as strong as its coffee. Seattle has shown consistent progression in its association with cannabis, with the creation of niche tourism companies like Kush Tourism, which capitalize on the novelty of cannabis for individuals living in illegal states or outside the country. Everywhere! Seattle is stacked with marijuana dispensaries and job seekers looking to land a Seattle marijuana dispensary job. Make your way down to Freemont street where you will become immediately surrounded by a flurry of cannabis dispensaries and enthusiastic stoners. Stop by Have A Heart, a friendly, colorful dispensary that consistently supplies customers with top quality bud for a reasonable coin. Though there are several locations scattered throughout the city, visitors can take advantage of rotating deals and promotions. While recreational marijuana delivery services aren’t technically legal in Seattle, Rent-a-Vape exists to make the stoner’s process easier. This service provides individuals with high quality vaporizers that they can use on vacation, without having to purchase marijuana paraphernalia. Vaporizers also allow for less harsh, more discreet smoking that creates a more relaxing experience for the cannabis inclined. Since 1991, Seattle has hosted a yearly protest rally, known as Hempfest on the third weekend in August. Originally starting as a small gathering, the festival grew dramatically with each passing year, drawing music and art displays, vendors, speakers and masses of attendees. The 2016 presidential election saw an encouraging breakthrough in passing more comprehensive cannabis laws across the country, rather than just the west coast. Now, east coast states like Massachusetts are experiencing the first stages of recreational marijuana legalization, while the always split conservative/liberal population of Florida passed medical legalization. It is likely that the next decade, if not the next few years, will reveal countrywide marijuana decriminalization that will hopefully remove the Schedule 1 status of cannabis and create sweeping legalization. For the time being, enjoy the thriving cannabis cultures of America’s west, breathing in deeply all that each city has to offer.